Sightings of otter have become increasingly common on this stretch of the river Wharfe, but how can you be sure it’s an otter? Once commonly found in Britain they virtually disappeared from our rivers in the 1950’s. This was as a result of pesticide use which was running off into our rivers and polluting our water sources. Otters are at the top of the river food chain and therefore these pesticides accumulated in their bodies. 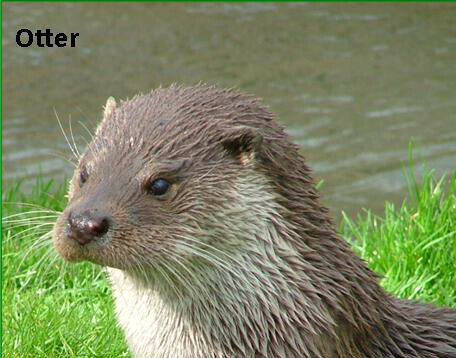 Hunting was also to blame, however this was banned in 1978 when otter numbers were reaching critical levels. Otters are also protected by the Wildlife and Countryside (1981) Act preventing intentional destruction, injury or disturbance. We occasionally find otter prints and spraint (droppings) along the riverbank. Otter spraints are left in prominent places such as tree bowers or on rocks. Spraints have a signature scent that is unique to each otter The footprints of otters are asymmetric and normally only show 4 toes even though they have 5 although this depends on the surface they have been walking over. The webbing between the toes doesn’t normally show. The prints of mink are much smaller across and the toes more spread out. These animals are descendants from mink that escaped or were intentionally released from fur farms, are an ‘alien’ species, and don’t fit properly into the UK’s ecology. There are control programmes in many areas. 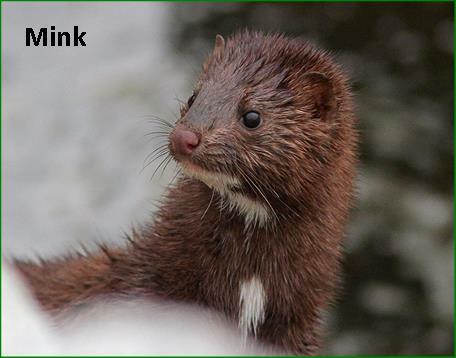 Mink have contributed to the decline in native species such as the water vole, they hunt water birds, such as moorhen and ducks. They are aggressive predators and will overkill prey and may also damage fish stocks.